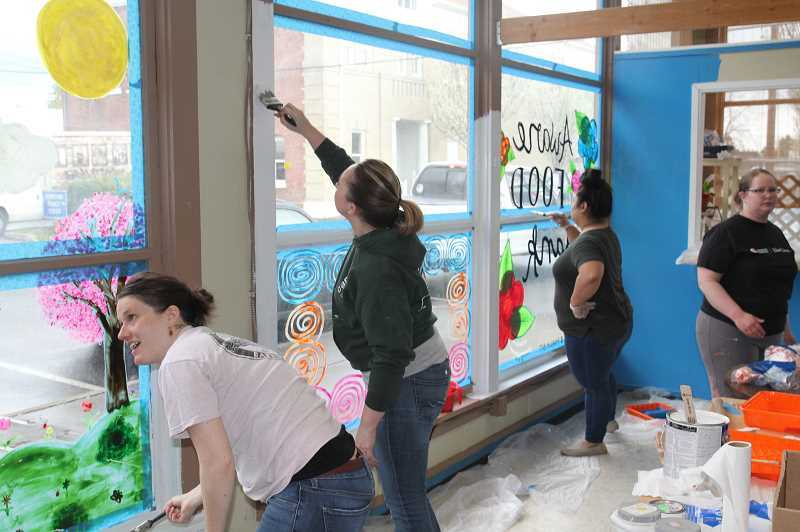 The walls of Woodburn's AWARE Food Bank lobby were a tad drab on Tuesday morning, April 2. 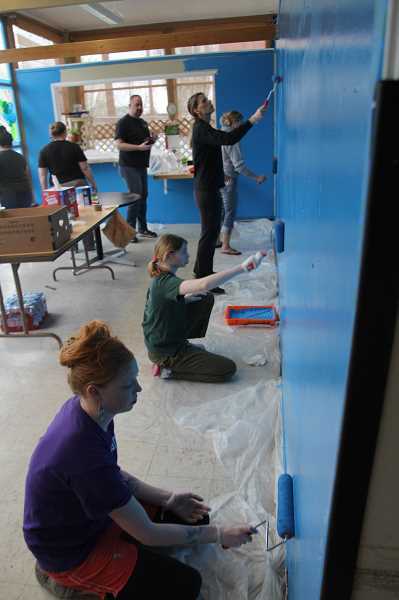 But 10 visitors from the Marion-Polk Food Share teamed up with food bank coordinator Gabby Pena for two hours Tuesday afternoon and left a beautified, Olympic-blue reception room in their wake. Pena and MPFS Community Ambassador Robbin Kerner coordinated the undertaking, while the visiting team comprised primarily of food-share development staff. 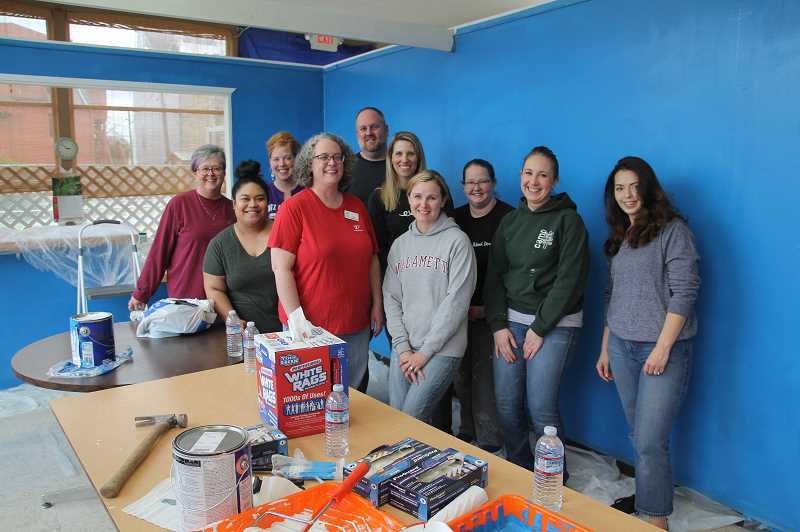 Local business Sherwin Williams and nonprofit Habitat for Humanity also facilitated the mission by contributing paint and supplies. "The idea is all Gabby's," said MPFS Vice President of Donor Relations Julie Humbuchen. "This team from the food share are all office workers, so they're happy to get out and do something like this. It's a wonderful project." Pena added: "Robbin reached out to me to volunteer, and we thought it was a good opportunity to work together." 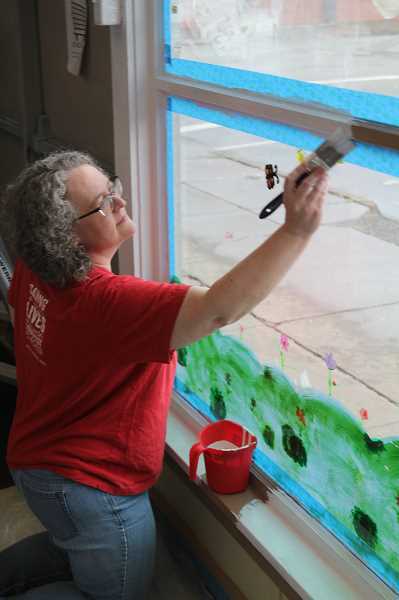 Pena said outreach, both to community members who need the food bank and to local businesses, was a priority when MPFS hired her as the AWARE coordinator last December. The work-task meetup melds well with that aim as the food bank suddenly became a more welcoming environment. "Our concern is that when people come in we want them to be in a welcoming atmosphere; we want them to feel comfortable," Humbunchen said. "A big part of that is making it look cheerful." Pena has also lined up someone to further adorn the wall with a fruit-and-vegetable themed mural down the road. "One thing that has really changed in food banking is it used to be, probably 10 or 15 years ago, canned goods where the main thing," Humbunchen said. "Now a much larger percent – I'd say about 40% -- comes from fresh fruits and vegetables. "All of us want to eat healthy, fresh foods, and that includes people who need to visit the food bank…In the Willamette Valley we can do that with the help of (the region's) farms and grocery stores." That help is broad and varied. "Marion-Polk Food Share receives donations of fresh, healthy food from many sources, ranging from a few boxes from a backyard gardener to a truckload from a large farm or a grocery store," Humbunchen said. The MPFS network, which includes more than 100 partner agencies, provides access to emergency food to more than 9,000 families, affecting 46,000 people, every month. That amounts to over 10% of the two counties' combined population. Included in that number are 15,000 kids. That access can come from directly visiting a food bank or pantry, hot meals served at shelters, free community meals served at an area church, foster homes, senior housing or even Meals on Wheels. The MPFS mission statement emphasizes: "This nutritious food will stave off hunger for an individual or family when they need it most." "The Food Share delivers the food to local organizations like AWARE, and they share it with individuals and families who need it," Humbunchen explained. The nonprofit AWARE (All Woodburn Area Resources Enlisted) operates contractually with the US Department of Agriculture. Oregon Food Bank and MPFS are its main sources of food, but it is also boosted by donations from individuals, churches, community service organizations wholesale food distributors and grocery stores. The latest statistics show AWARE Food Bank provides food to 1,000 families each month, totaling 5,600 people each year. Marion-Polk Food Share sources stress that it takes a community to fight local hunger. The food share welcomes donations of food and funds, noting that struggling families help them today so they can work to make a better tomorrow. MPFS also supports programs that address the root causes of hunger, including community gardens, job skills training, partnerships with Oregon State University Extension 4H Youth Program, agricultural entities and youth leadership training involved with growing produce for emergency food distribution. 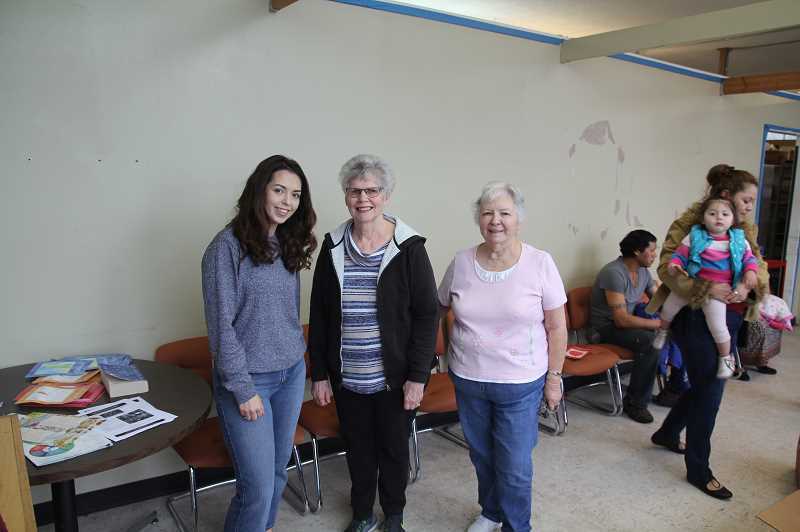 Woodburn's AWARE Food Bank is among MPFS 100-plus partners, operates via donations of various types, including donations of food, funds and people's time through volunteering.